Another way to share your content is to click on your own sharing buttons on the article itself. This can be faster but it still takes time, especially if you share with multiple networks and you need to shorten the URL’s. The more networks you share with the longer it takes. The longer it takes, the less likely it is to get done. The more often you post… well you get the idea. And then there’re your friends who just noticed you’re on Facebook and they want to chat. Posting your update to social networks can take more time than you have to devote to it. There has to be a better way. Well, you’re in luck, because there is a better way and it doesn’t even have to cost you anything! You can post to your favorite social networks, specifically Facebook and Twitter, automatically every time you create a new post on your WordPress website without having to do any other work or extra steps. Publicize is part of the free Jetpack suite from Automattic. 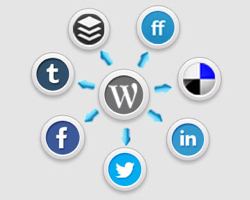 Connect your blog to six social networks and automatically publish your new posts to those networks. 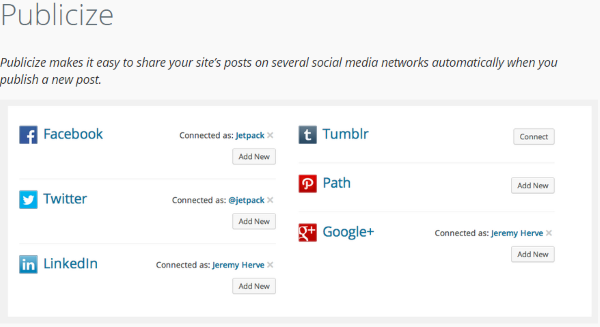 You can have it to share only your posts or posts from all users on your blog. You can create a custom message for each post if you want and if you want the post to not show up on a specific network you can unselect it for that post. It includes detailed instructions to set up your social networks. It also adds sharing buttons that you can enable for your posts so your readers can share your content with their social networks. Jetpack is one of the easiest to use. You don’t even have to think about it being there. This ease-of-use unfortunately simplifies its feature-set. You can’t use tags, post entire articles, or schedule your posts. If all you want to do is post a link and a short snippet with an image then Publicize will work just fine. 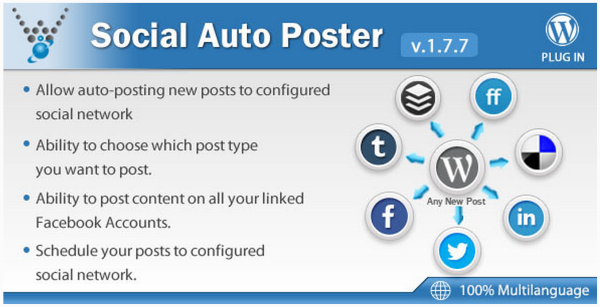 This one will automatically republish your blog posts to many different social networks. It even has URL shortening. You can set your posts as text, image, or text with attachment. You can also set up the message format. It will post the entire article or just a snippet with a backlink. 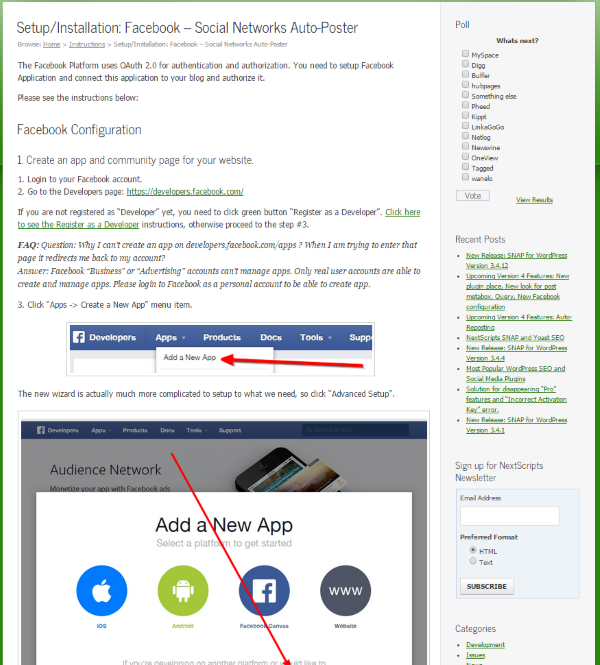 It works with profiles, groups, community pages, business pages, etc. Messages are 100% customizable for each network individually. It supports close to 30 networks. It has a detailed list of instructions for each of the social networks. Setting them up does take a few minutes for each one, but the instructions are up to date and are easy to follow. You can use tags and custom taxonomies, filter by category, publish comments as WordPress comments on your pages and posts, and set up the timing of how and when the auto-posting works. One thing I like about this one is you can create a post just for your social networks and post to all of them at once – without posting it to your WordPress website. This is an excellent way to handle posting to multiple networks at once without having to write a post for your own site. Of course any posts you do write for your site will be posted too. It’s easy to set up and use. 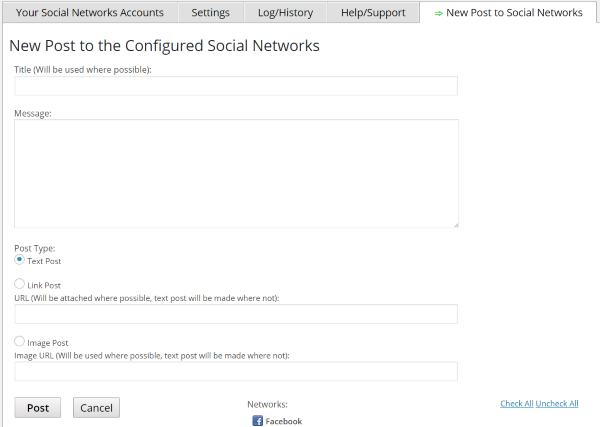 Once it’s configured you can forget about it or you can make adjustments for each post individually. There’s also a Pro edition for $49.95 that adds scheduled and delayed posting, auto-reposting for existing random posts from specific dates, and limiting random or one-by-one auto-reposting for specific days of the week and times. 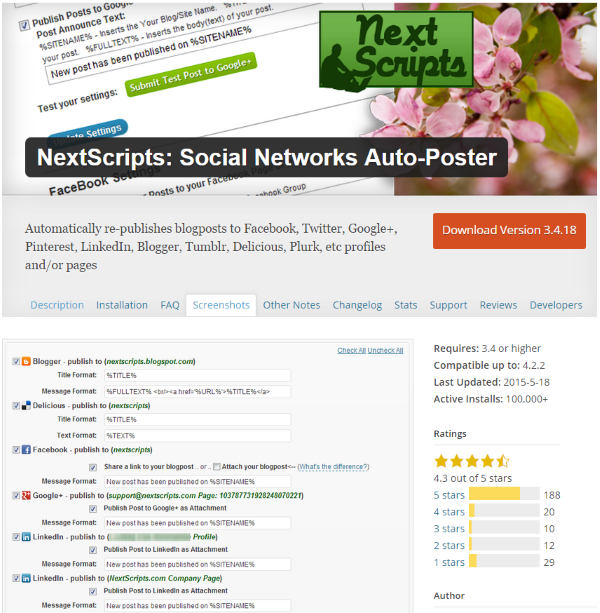 This is one of the most feature-rich plugins for posting to your social networks. It will post your URLs directly on social timelines and private messages. It adds Open Graph / Rich Pin meta tags with configurable image sizes for Open Graph. It supports featured, attached, gallery shortcode, and HTML image tags within the content. It creates and uses hashtags from page and post tags. It places sharing buttons on your dashboard next to your visual editor so you can share your own content from there if you want. 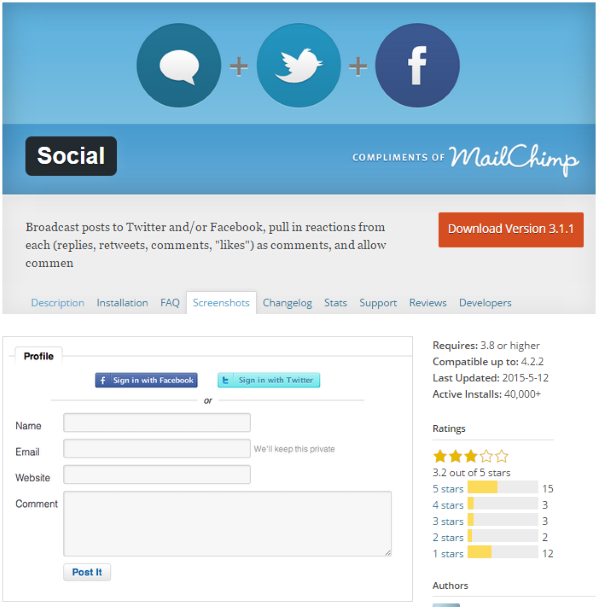 It also adds social media buttons so your readers can share your content with their own social networks. It includes a setup guide to get your started and each field has a tool-tip with detailed information and links where needed. Setting it up is more difficult that some of the others I tried. The instructions are not as clear and complete. When you do get it set up it works great. There’s also a Pro version that adds Twitter meta cards, Customizable image dimensions for each Twitter Card type, Additional profile contact fields, A custom social setings metabox for each post, page, custom post type, user profile, and taxonomy (category and tag) pages, URL shortening, include / exclude sharing buttons by post type, Integrates with 3rd party plugins and services, and much more. It has a per-site pricing structure: $44.95 for a single site, $36.95 each for two sites, $31.50 each for three sites, etc. This free plugin from the makers of MailChimp will broadcast your WordPress posts to Facebook and Twitter. It will also bring in the responses and mentions (replies, comments, retweets, and likes) from those networks and post them as comments on your WordPress posts. Users can reply to those offsite sources, or comment using their Facebook and Twitter identities and links will point back to their profiles. There isn’t a lot to set up on this one. You connect it to your Facebook and Twitter accounts and then set up the formatting. Connecting is as simple as hitting the button and signing in. That’s it. 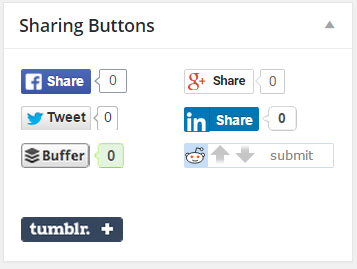 It works just like a sharing button, making it one of the simplest to set up. You can broadcast pages, posts, and projects. 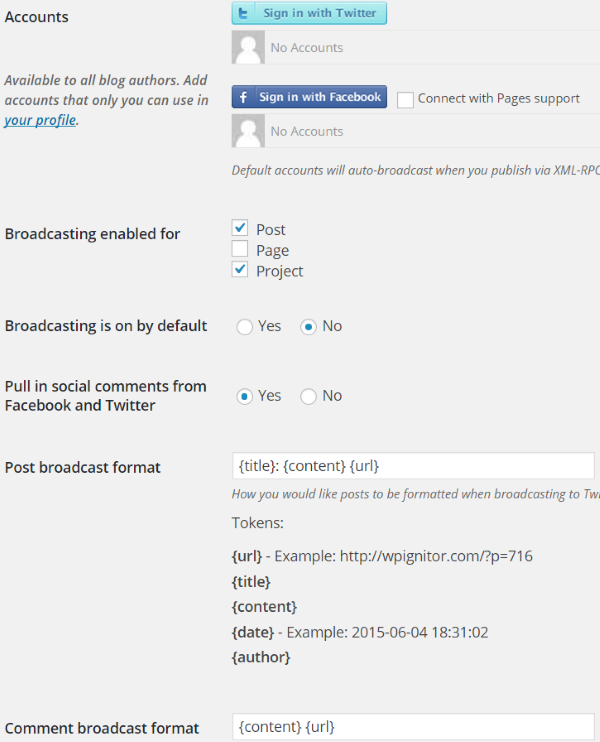 You can choose the formatting for broadcasting and commenting. For broadcasting you can choose URL, title, content, date, and author. For comments you can choose content and URL. It’s probably the easiest to use and I like its commenting features and formatting capabilities. For one without tags or URL shortening this might be my favorite. 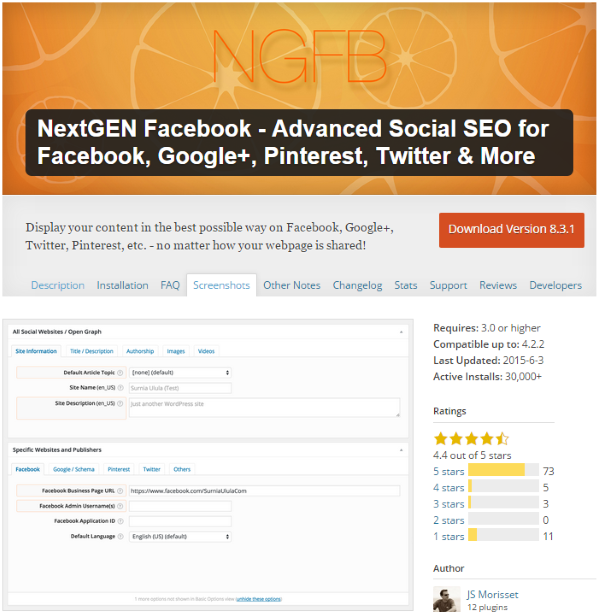 This free plugin will only post to three social networks: Facebook, Twitter, and LinkedIn. It will post with URL’s and images. You can filter your posts based on custom post types and categories. You can create custom message formats for each network. If you want, you can disable auto-posting for any post. It places settings in your post editor in case you want to make adjustments on each post individually. The message formatting is an interesting feature. You can choose between title, permalink, excerpt, content, blog title, and user nickname, and place them in any order you want. There isn’t a lot to set up for this one. You provide the access keys and tokens, set up the message formatting, choose whether or not to include an image, choose whether or not to auto-post, and who to share the content with for each network. You can also choose to publish pages, posts, categories, custom post types, enable link to author, etc. For Facebook you can post as text with an image or text with an attachment. There’s a Pro edition for $29 that adds LinkedIn groups and company pages, Pinterest, and Google+. It also provides some preferences for images, posts to multiple accounts on the same networks with separate message formats for each, republish posts, and more. This one will automatically post to seven different social networks. You can choose which post types to publish between pages, posts, and custom posts types and you can have different settings for each. It also has a built-in URL shortener. It has a custom scheduling feature so you can schedule your content on all of your social networks. It will post to multiple Twitter accounts. It will log all of your social posting into your site’s database. This is a premium plugin. The Regular license is $28 and is for use by you or one client in a single end product that end users are not charged for. The Extended license is $140 and is for use by you or one client in a single end product that end users can be charged for. WP HootSuite Dashboard – integrates HootSuite with your WordPress dashboard and lets you schedule and post directly from WordPress. 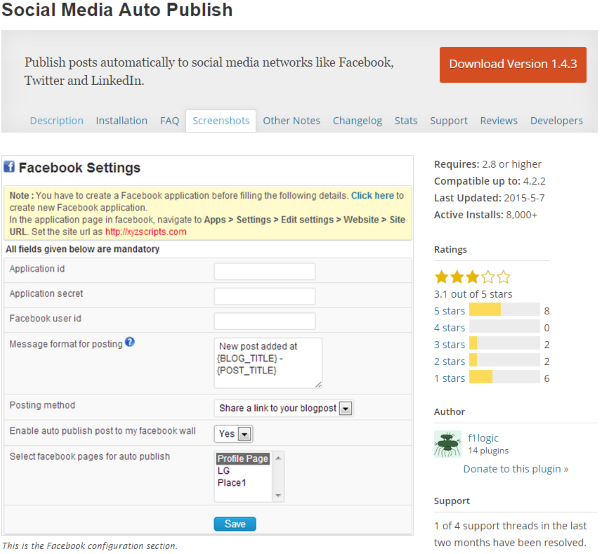 Plugins make posting your WordPress updates to Facebook and Twitter easy and effortless. With the right plugin and settings, the process will work automatically without any input or work from you – saving you time for other things… like creating new content. Your turn! I want to hear from you! Do you post your WordPress updates to Facebook and Twitter automatically? Do you use one of these plugins or is there another plugin or method that you recommend? Tell us about it in the comments below. Randy is a freelance writer specializing in WordPress and eCommerce. If he's not writing or reading, then he's probably playing guitar. You can see Randy's writing services at randyabrown.com.